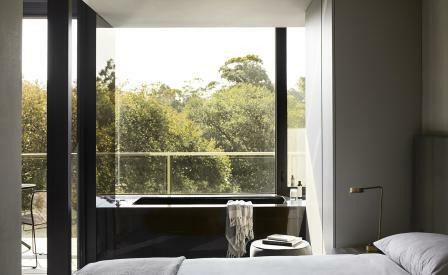 Melbourne’s latest luxe bolthole – United Places Botanic Gardens – is a subtle beauty. There is no foyer. Instead, at the end of the entryway, light thrown by Laura Woodward’s kinetic sculpture set in a conical form in the ceiling indicates where one should wait for the lift. First-time hotelier Darren Rubenstein envisioned a blend of home and luxury hotel for the venture and commissioned Carr Design Group for both architecture and interior design. The firm’s natural affiliation with minimalism is softened by texture. There are 12 suites – three with two bedrooms and a soaking tub, the others with one bedroom. All feature a kitchen, shower encased in reflective glass (allowing the bather to enjoy the view), balcony, a blend of imported and locally designed furniture, and suede drapes – either forest green or dusty pink – that enclose the bedroom to create a hallway.